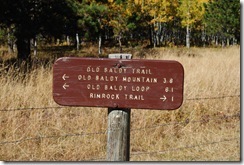 Old Baldy is an amazing fall hike in the Northern Black Hills. The yellow leaves of the quaking aspen and paper birch are just beautiful. Even though autumn is my favorite time of year to hike Old Baldy, I recommend using the trail all year long. The trail is a 6 mile long loop with 0.7 mile spur to the top of Old Baldy. It is a moderate trail and can be enjoyed by hikers, snowshoers, cross-country skiers, bicyclists and horse back riders. If you plan on hiking the trail with your snowshoes I would point out a couple of things. In the winter you can only access the trail from Tinton road. Also, when I’ve been up there in the winter, the parking lot is not plowed, so you’ll have to park along the road (plenty of room to park on the side). There are no services along the trail. I would encourage you to bring plenty of water and snacks. If you are bringing children, be sure to bring more food and water than you think you’ll need. A full tummy, makes for a happy hikers. Grazing is allowed in this area. I remember one fall several years ago, my wife, my oldest daughter and I came over a hill and a rancher was bringing in the cattle for the winter. It was like a scene out of a movie. The sky was incredibly blue (like it often is in the Black Hills), the fall foliage was in full color, and the ranchers were atop their horses rounding up the cattle. It is a great memory. 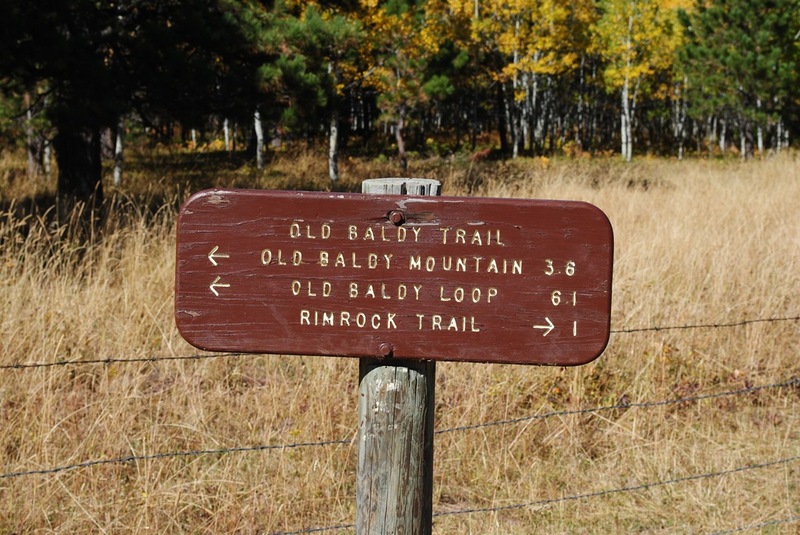 How do you get to Old Baldy? I like to get to Old Baldy from Spearfish Canyon. At Savoy, turn off Hwy 14A on to BHNF Rd 222 (the road to Roughlock Falls) and travel about six miles. Then turn North on Tinton Rd (BHNF Rd 134). Just over a mile up the road is the trailhead. Keep in mind, if you are going to enjoy this trail in the winter, BHNF Rd 222 is closed to all but snowmobile traffic from December 15th to March 31st. Then you’ll have to get to the trail via Tinton Rd, either from Spearfish or US Hwy 85. If you don’t want a long hike, there are plenty of other great hiking options in Spearfish Canyon. The trail is located south of Iron Creek Lake. Eagle Cliff Trails – South of Old Baldy, this is a fantastic trail system. This is another Black Hills Hiking Trail that can be enjoyed all year long. It is great for mountain bikes in the summer and in the winter there are groomed cross-country ski trails and separate snowshoe trails. Mount Roosevelt – This trail is close to Deadwood. It offers amazing views with little effort. Friendship Tower is located there and is worth checking out. 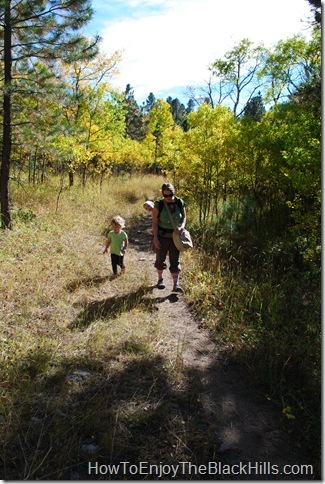 Roughlock Falls Trail – A great trail that starts just behind the Spearfish Canyon Lodge in Savoy. A easy hike with great views and ends at the Falls. Big Hill Trail – Just up the road from Old Baldy. Groomed cross country ski trails and separate snowshoe trails in the winter. 16.5 miles of hiking, biking or horseback riding in the summer. The Black Hills National Forest website has a free map on their website. If you are going to be hiking and traveling in the Northern Black Hills, I would encourage you to pick up a copy of Black Hills Map 751 . It is a great map that will help you navigate roads and many of the hiking trails are marked. Please enjoy my video. It starts out with the drive from Roughlock Falls and ends with some of my favorite photos of the area. 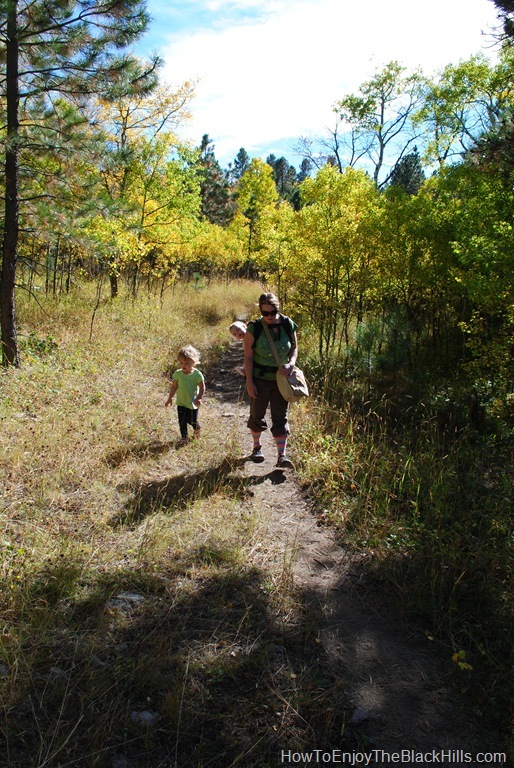 There is no shortage of hiking trails in the Black Hills, what is your favorite?